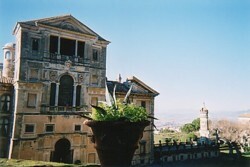 Frascati, in Lazio at a short distance from Rome, is a popular daytrip destination from the capital. Frascati is one of several attractive historic hilltowns to the south-east of Rome known collectively as the Castelli Romani. Every weekend these towns, and Frascati in particular, fill up with Romans looking for a change of pace, clean air, good food and wine. Often groups of Romans will drive here just for the evening, dining at one of the many informal restaurants which serve rich regional specialities and the local white wine. The air is noticeably fresher than in the city, and in the sweltering summer months it has always been a popular resort. The wealthy built villas here, many of which are still standing although they're not open to the public. The most impressive is the Villa Aldobrandini, designed by Giacomo Della Porta for the nephew of a pope. This palace dominates the town, hovering above the central piazza in faded splendour. The gardens are open to the public and are free to visit - you just need to collect a permit from the tourist office first. On a weekday the grounds may be completely empty, and you can explore the terraces in solitary state. A gigantic water feature (no longer functioning), sculptures and architectural follies dominate the gardens behind the Villa, and you can climb up beside the crumbling cascade and imagine the estate in its glittering heyday. The Villa Torlonia, nearby, was destroyed in the war. Nowadays it is a public park, where office workers jog in their lunch hour. You can still admire the gardens, and an impressive fountain, the Teatro delle acque (water theatre), designed by Carlo Maderno. The cathedral is worth a look, as are some of Frascati's other churches. There's no tourist circuit of important sights in Frascati. The chief appeal of an excursion is the relaxing ambience, fine feasting, and wandering around the evocative medieval streets and the faded grandeur of the aristocratic past. 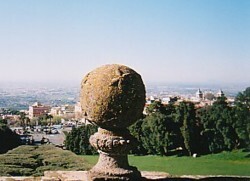 Frascati is 13 miles (21km) from Rome, and is easily reachable by public transport. COTRAL buses run frequently from Anagnina metro station (remember to buy your tickets in advance from the kiosk at Anagnina, and to validate them when you get on the bus). For more information about COTRAl buses, see the Lazio transport page. There is also a local train service from Rome, which leaves from Stazione Termini. 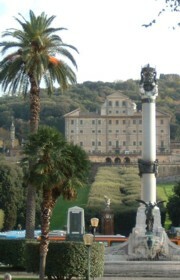 The Frascati tourist information office is situated on the main square, Piazza Marconi. This is where the buses from (and to) Rome stop. There is also a panoramic terrace and a gelateria close at hand, so it's a good place to sit down and get your bearings when you arrive. Both the tourist office and the gardens of Villa Aldobrandini are closed for a couple of hours at lunchtime. The town is full of good eating places, and you won't leave feeling hungry. Try some of the Frascati wine, which tastes particularly good (and is admirably cheap) in its hometown. There are also countless wine shops where you can sample and purchase the area's Frascati DOC. February - Carnevale, with parades and celebrations. May - Festa dei SS Filippo e Giacomo, a festival in honour of the town's patron saints. 23 June - Sagra della lumaca, a snail-eating outdoors feast. October - Sagra del vino, wine festival.